It has been a few weeks since I've painted landscapes, so I spent yesterday focused on the task. Imagining the smell of lavender in the spring was where the practice took me. 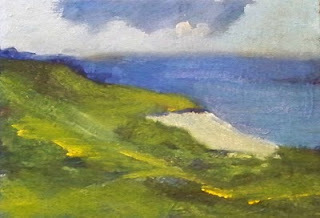 Among some of my musings is this little 5x7 inch painting. It is listed for sale in the Small Impressions Gallery and can be purchased for $35.00 plus shipping by clicking here. Yesterday snow blew into my life. In Western Washington State, snow is uncommon. We receive a dusting several times a year, but unlike other parts of the country, we don't spend weeks and weeks under a blanket of it. It is a mild climate, but because we are not used to the daily drudgery of a snow-covered landscape, most of us just stay in the house and keep warm. School is cancelled and offices are closed. As a result, subjects for yesterday's paintings felt limited. My collection of photos has been sorted too many times and my inspiration lagged. Apples in my refrigerator were one of the few objects that seemed to provide some color to my day. 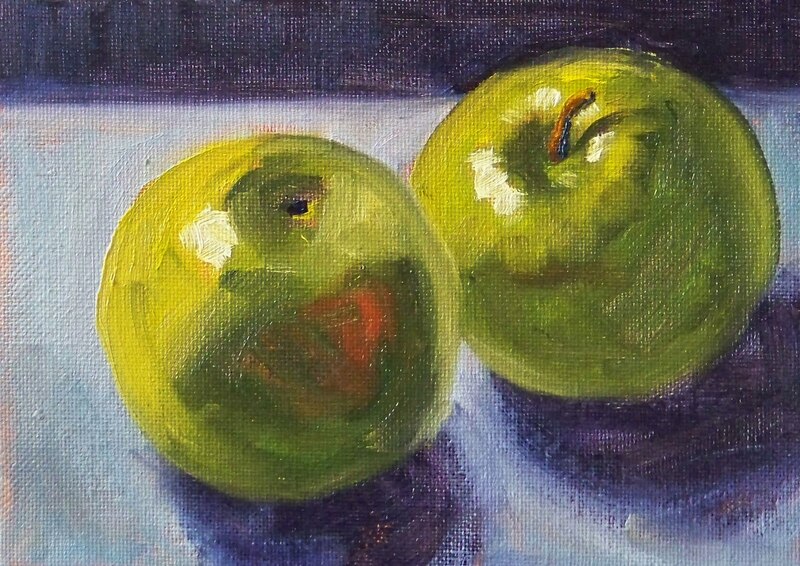 This is one of two paintings that resulted from my discussion with the apples. I was quite excited today when a contact at Flickr sent me a note that this painting had been included in a blog entry at alivenotdead.com. Time and the Apple was a fun read and it was a pleasure to be a part of it. 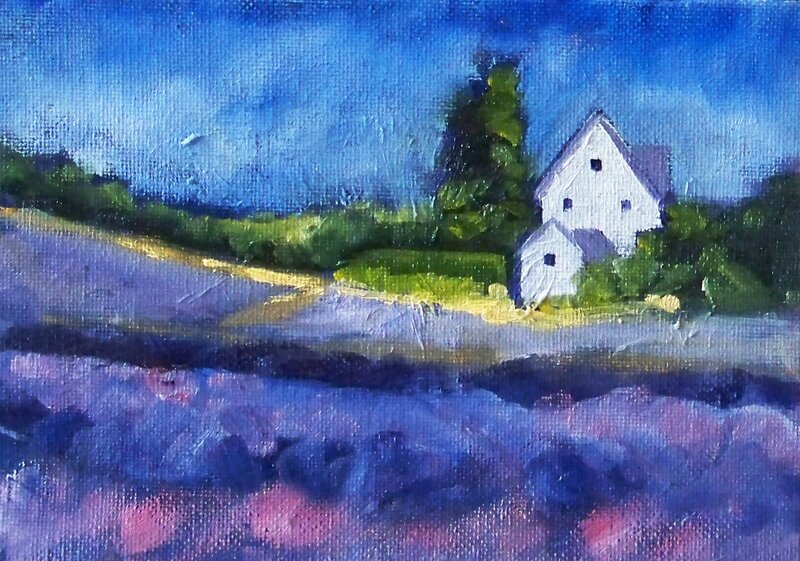 This painting is 5x7 inches on a canvas panel and has SOLD. 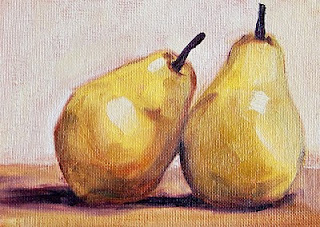 If you click the links, you can view some of my other fruit and tripical fruit paintings that are currently for sale. Painting things that are white is tricky because it doesn't work out to actually use much white. 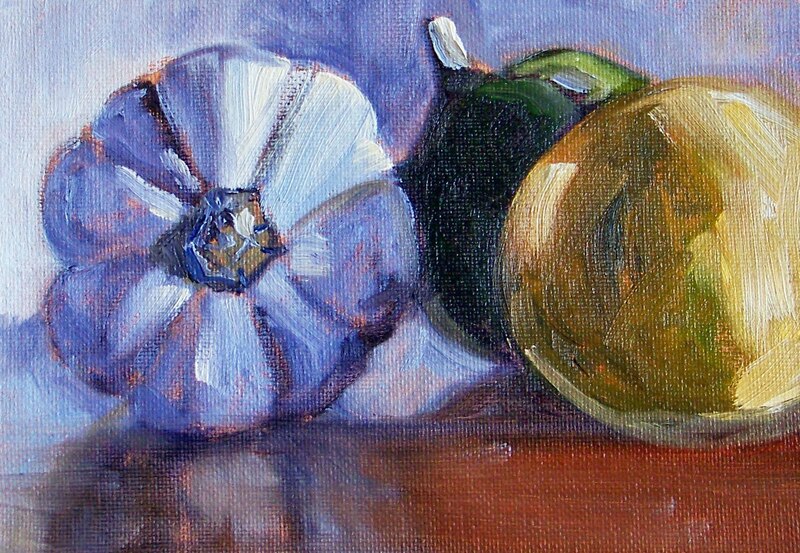 I liked the way the light played on this white pumpkin, but I've struggled with getting the white to look like white. I'm pretty happy with the way it turned out, but the secret is, I didn't use much white when painting it. Yes, there was white in the mixture, but as far as white from the tube, there isn't any. Everything is a mixture. So, this is my most recent challenge: painting white things. This painting can be purchased for $35.00 plus shipping by clicking here. One of my favorite things to paint also turns out to be one of my favorite snacks. 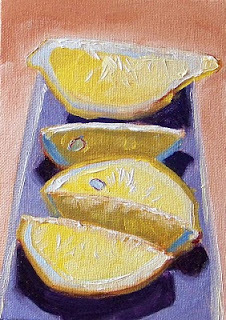 This painting is 5x7 inches and a nice addition to the collection of small fruit paintings for sale at the Small Impressions Gallery. It can be purchase for $35.oo plus shipping by clicking here. The rain has returned, but a couple of days of sunshine left me feeling renewed. 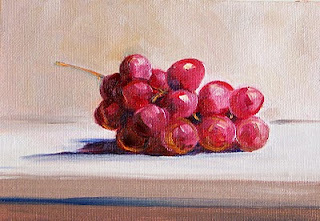 I sat this cluster of red grapes on a table by the window and pretended it was a sunny day. The light was just enough to create a shadow and inspire me to paint. The painting is 5x7 inches on a canvas panel. It has SOLD, but you can view some of my other paintings for sale at the Small Impressions Gallery . There is a large collection of small fruit paintings available for purchase. This weekend I visited the coast and was lucky enough to do it on a day that had some long lost sunshine. 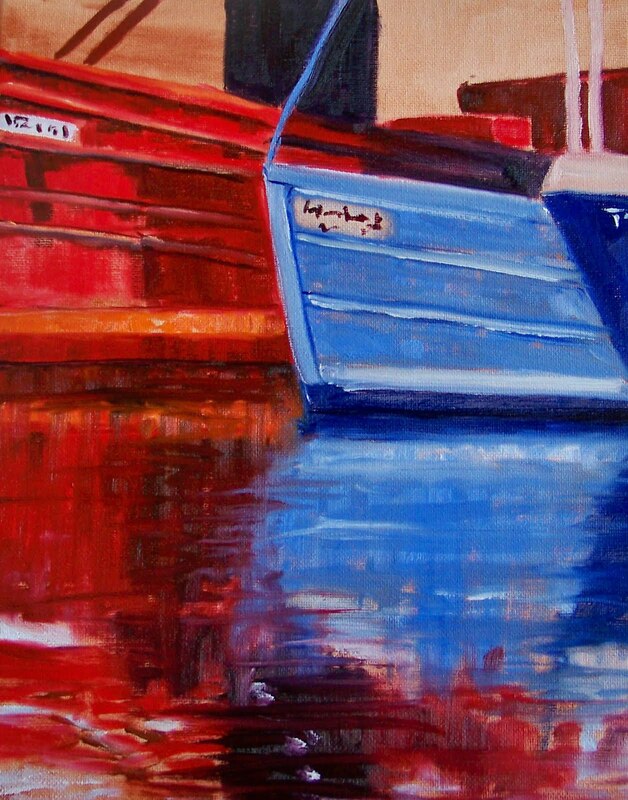 Walking the docks and enjoying the fresh air inspired this 11x14 inch oil painting. It was fun to have the sensation that spring is coming and remind myself that the bleak winter weather is passing. 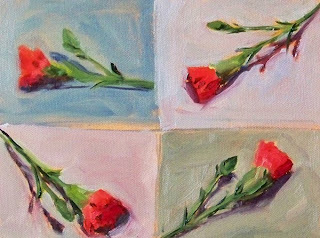 As I mentioned to several who commented on my last post, I don't paint flowers often, but I played with my carnations a bit more. This is a 6x8 inch Raymar canvas panel that I divided into four segments. For each segment, I moved the flower and painted the background with left over paint mixed with white. It was fun to see the possibilities. I think my favorite is the one in the lower right corner. My husband always gives me carnations for special occasions; today was no exception! It is our tradition and I love the fact that he doesn't give me roses. We are a pair of practical minded souls and the price of roses makes me cringe. I'm happy with my carnations and am glad that he and I almost always see the world in the same way. 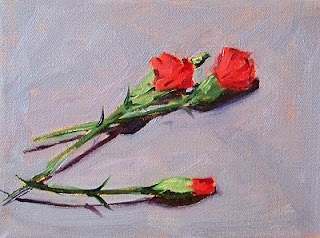 Today's 6x8 inch oil painting is a few blooms from a lovely boquet. This painting is for sale along with some of my other small floral paintings in the Small Impressions Gallery at Etsy. Click here to view and purchase. Today I tried to get out for a little hike, but the wind came up, the rain came down, and I headed for the car. 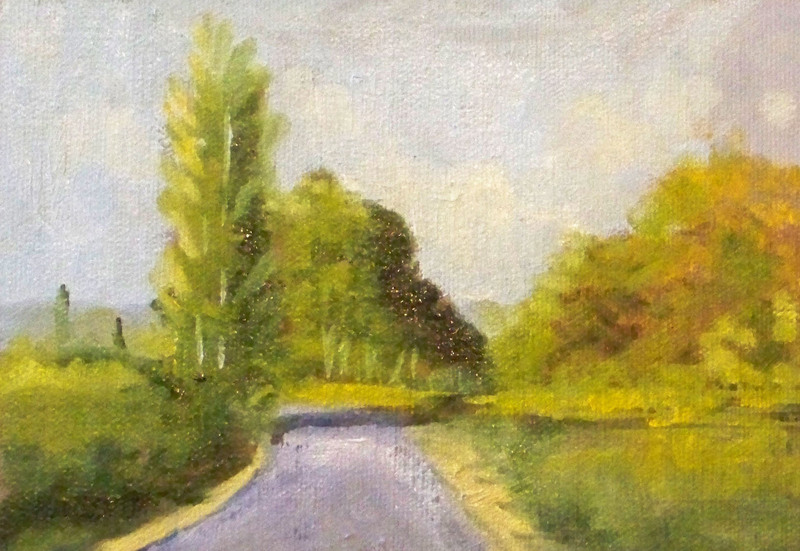 When I got home I imagined what it might have been like on a sunny day and painted this little 5x7 inch oil painting. It is for sale at the Small Impressions Gallery where you can view or purchase it for $50.00 plus shipping costs. Today's painting took me on an imaginary trip to Paris where a photo of this bridge in the evening lights was taken and has since inspired my paintbrush to color a canvas. 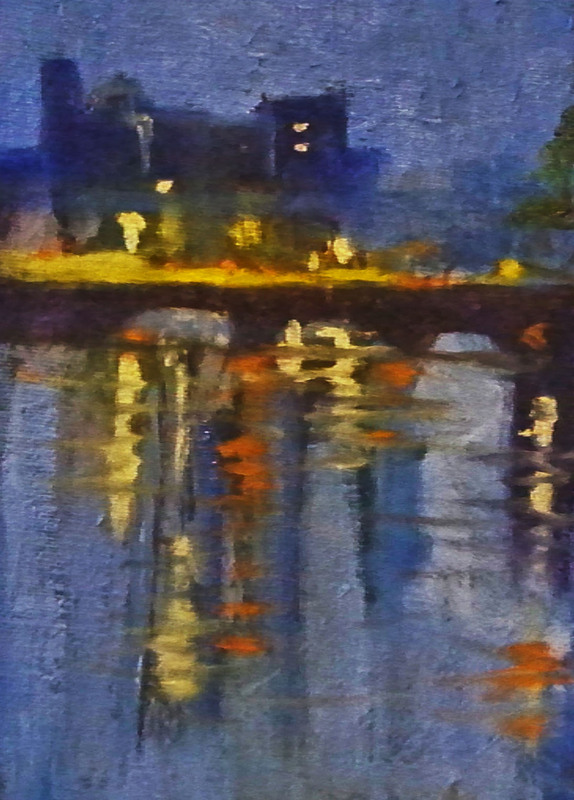 Abstract cityscapes are fun to paint, creating all those little blinking lights of the evening and the colorful reflections on the river. 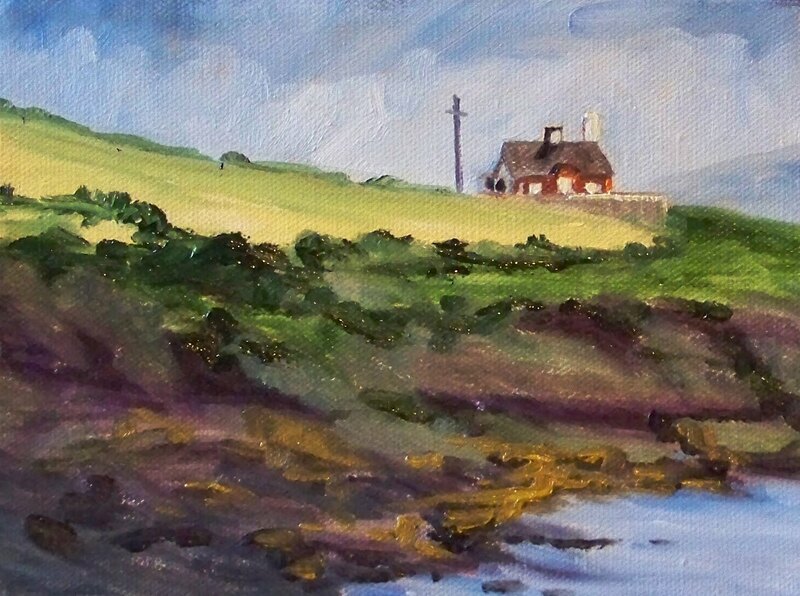 Today's painting is another 5x7 inch painting from my Irish collection. It is clear why it is called the Emerald Isle when one views the fields of green that hug most of the landscape including the coastline. The fog hangs on the horizon and reveals a cool wonderland that was really fun to paint. To purchase this painting or view it in the Small Impressions Gallery, click here. The price is $35.00 plus $6.50 for shipping to addresses in the US. I almost forgot to post this little 6x8 inch painting. It is based on a photo my daughter shared with me from a recent trip to Europe. I believe it is close to the town of Dingle in Ireland. It was fun to paint and a joy to view her photos. I am thankful that she has given me permission to paint any or all of her hundreds of photos. 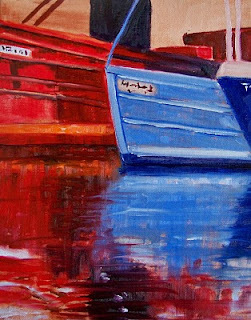 This oil painting on canvas can be purchased by viewing it in the Small Impressions Gallery and putting it in a shopping cart. As I sit and look out at fog and rain, I am reminded that warmer weather is just around the corner. 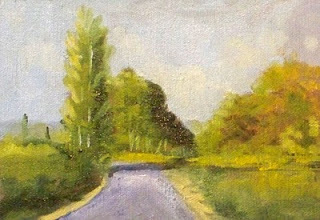 Today's 5x7 inch oil painting is based on a photo I took last summer on one of my favorite bicycle rides. The Foothills Trail begins in Puyallup, Washington, passes through the Orting Valley, parallels the Carbon River and concludes 15 miles later at South Prairie. The path is fully paved and motor vehicles are not allowed. 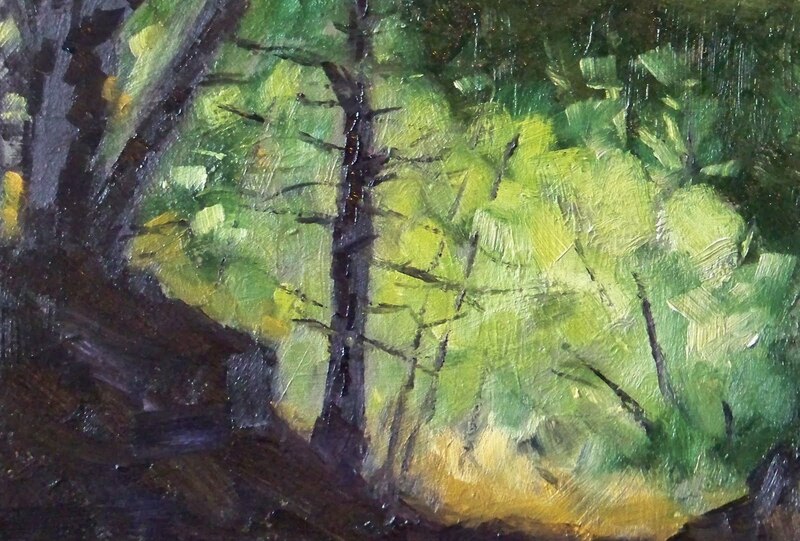 I'm longing for the warm weather and green trees that appear in my painting. Only a few more months until the bliss of warm weather returns. This painting can be purchased at my Small Impressions Online Gallery by clicking on this link. I'm back to painting lemons again--guess I am on a binge. The smell of fresh lemons and the yellow warmth keeps me coming back to this tropical subject. If I could only be picking these off a tree in a sunny climate, my dreams would come true. The painting is 5x7 inches on a canvas panel. Now that it is dry, it has joined some of my other tropical fruit paintings at the Small Impressions Gallery. Click here to view it in the gallery or put it in a shopping cart.